Is this a Stingray site? Update: Mystery solved? I believe this is a micro-site cell tower. 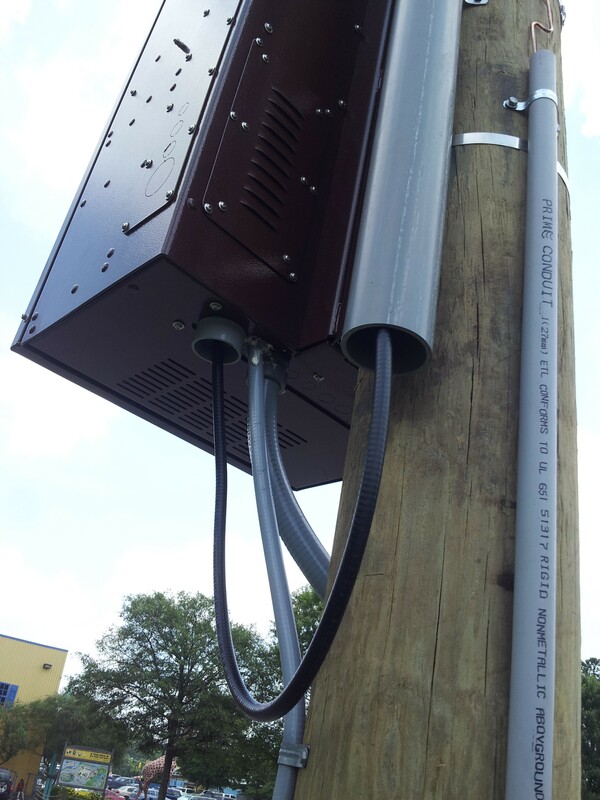 A few weeks ago when I went with Travis to a birthday party held at Adventure Landing on Capital Boulevard, the radio geek in me was drawn to an unusual device mounted on a utility pole outside. 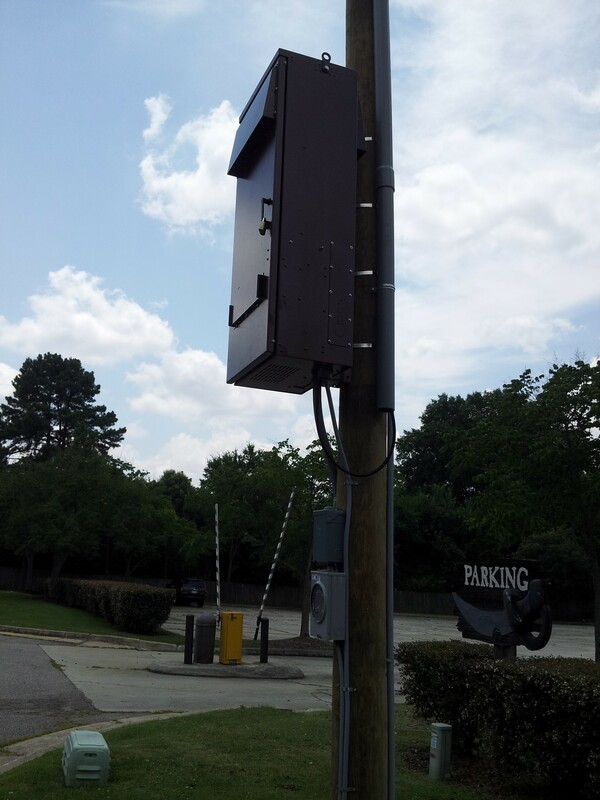 Located on the corner of the parking lot next to a sword-shaped, pirate-themed sign that reads “Parking” is a newly-planted utility pole. Mounted on the pole is a locker-sized utility box, meter box, antenna feedline, and a cell tower-shaped antenna on top. All of these were painted brown to match the nearby light poles in Adventure Landing’s parking lot. It appears to me to be a mini cell tower of some sort but it does raise some questions. Capital Boulevard is arguably the busiest street in the city and this spot is near its intersection with I-440. This would hardly be considered a cell phone service “dead zone.” Why would a single-node booster tower be here? 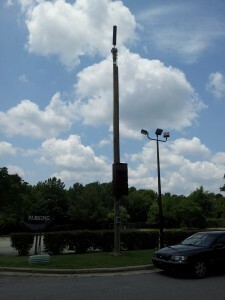 The paint matching the parking lot light towers strongly associates it with Adventure Landing. Tower owners get a cut of revenue from each call they carry. Is this an extra source of revenue for the amusement park? If so, why would the antenna be in the back of the property, shaded by the building from the 50,000+ cars that pass by each day in front of it? That’s a lot of revenue given up. If it’s simply a boost for the park patrons, why not put the tower on the top of the building where it is not only taller but more centrally-located on the property? Then again, though, this is Capital Boulevard – thinking this area is a dead zone is ludicrous. And if you have a perfectly-good building to mount your tower on – one that’s actually taller than a utility pole – who would go to the trouble and expense of planting a separate pole? It’s possible that RF considerations means you have to have it a certain height above the population, I suppose, but you could easily reduce your power and still cover a four-acre park, right? What’s interesting is that the pole is actually on the city right of way (ROW) and not private property. I don’t see how the city would give the nod to any old fool who wants to plant his or her own utility pole in the public right of way. It’s my understanding that such approval would have to be approved by the city council as all ROW encroachments are. So, either there’s a record of this pole being approved to be planted here or the pole in violation of something or another. This is provided that Pine Knoll Drive is in fact a public street but a look at the site in the city’s IMAPs system seems to show that it is and that the pole is indeed in the public ROW. This hardline and the antenna on top show this is a cell tower site. 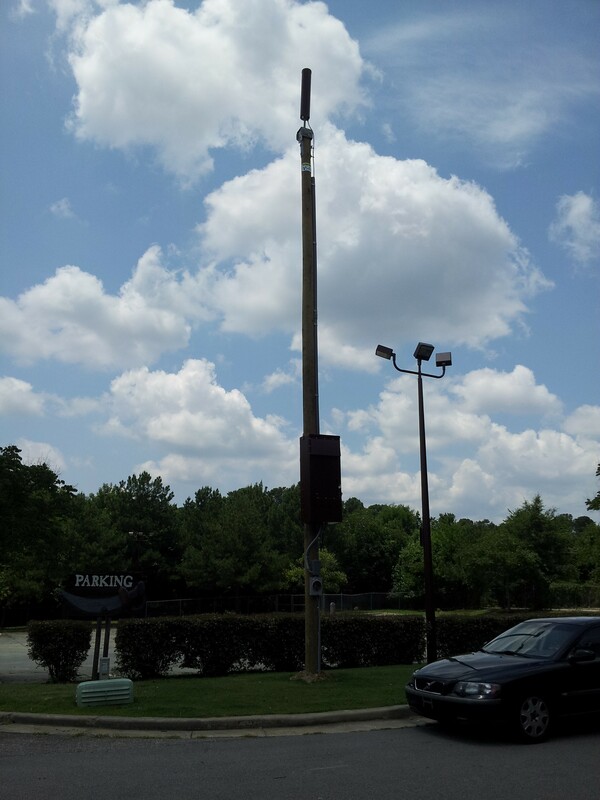 I sort of forgot about this interesting tower until I read this week’s WRAL story that the Raleigh Police Department owns a Stingray – a mini-cell phone tower that is used to intercept cell phone calls. Police departments that use it assure the public that their use of Stingray is lawful, yet the manufacturer, Harris, slaps a draconian non-disclosure agreement on its customers. This can’t help but make me wonder just how legal its use my be considered. Is this an attempt to keep judges in the dark? Perhaps to avoid having this question answered in a court of law? On the other hand, it could simply be a poorly-sited cell phone booster tower. Either way, the site is unusual and clearly designed to collect cell phone calls – the question is who is doing the collecting?